Escape to Pomona, a tranquil, relaxing community minutes from Downtown Houston and the Texas Medical Center. Located within the quaint city of Manvel, Pomona offers the absolute ideal blend of small town charm and big city living. Pomona is a truly unique community conveniently located near the Texas Medical Center and Downtown Houston. Pomona by Hillwood Communities elevates life’s everyday moments to take center stage. It ’s a place to both escape and connect, to unwind and to energize. Here, community isn’t a place, it’s a bond between neighbors, friends and families. Conveniently close but with plenty of breathing room built in, Pomona is ideally situated for those who want to live at their own pace. And as a Live Smart℠ community, amenities have been carefully designed to promote genuine connection, inspiration and growth. Along the tall grass and native wetlands of Mustang Bayou, you’ll find a truly connected community at Pomona. But perhaps the best feature is the one we left untouched—hundreds of acres of open space, greenbelts and marshland. No other community in the Houston area has kept this much land in its natural state—a difference you can see and feel each time you wind your way through Pomona. At Hillwood Communities, we differentiate ourselves from other residential developers by leading the way in state-of-the-art initiatives that contribute to smarter living. Pomona represents the culmination of decades of experience and refinement, developed with the goal of enabling our homebuyers to lead smarter and more balanced lives. 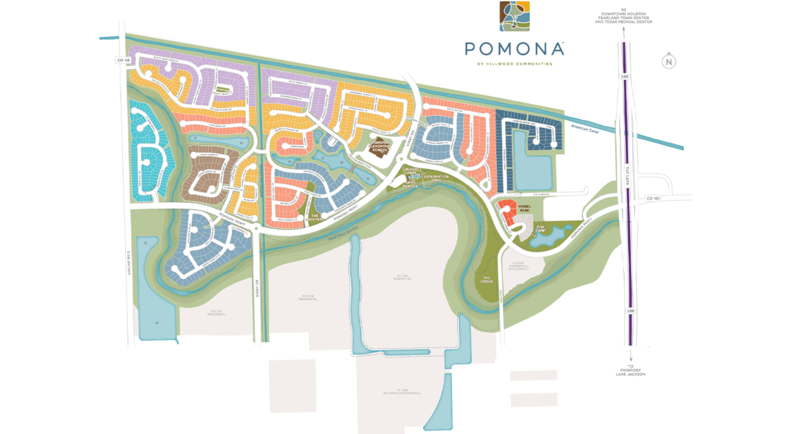 As a holistically designed Live Smart℠ community, by Hillwood Communities, every aspect of Pomona is specifically designed to address five key principles that nurture community values while delivering personal value — connection, well-being, enrichment, stewardship, and convenience.